"Identifying Families’ Needs during Palliative Care Post-stroke: A Qualitative Study"
Families are an important source of care for individuals who experience a stroke. Research suggests that these family caregivers commonly have poor mental health and can develop their own health problems. Even though they are important, there are no standard clinical practices to support family members who care for some who has had a stroke. Most research has examined caregiving to people who have a stroke, recover and return home. Considerably less is known about the roles and experiences of family members caring for someone who dies as a result of their stroke. Thus far, research has focused on palliative care for people with stroke. It has not considered the families’ needs during palliative care and afterward when families can struggle returning to normal life – bereavement. Although the Canadian Stroke Best Practice Guidelines include recommendations for palliative care, these recommendations are primarily informed by cancer and other non-stroke research. More information is needed from families to create programs and services offered by the health and social care systems to meet the needs of stroke families’ during palliative care, death, and bereavement. Current Status: We are recruiting family members to participate in this study. Click here to learn more! 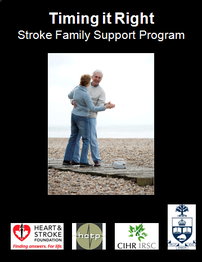 "Optimizing Stroke Family Caregiver Support Across the Care Continuum by Improving the Timing of Intervention Delivery"
We have conducted a Canada-wide study to determine if the Timing it Right Stroke Family Support Program (TIRSFSP) delivered across the care continuum contributes to positive caregiver outcomes (perception of being supported, mental health). To determine the impact of the intervention on caregiver outcomes, we compared two modes of intervention delivery with standard care: 1) repeated contact in person and by telephone with a stroke support person for up to the first 12 months post-stroke, and 2) a self-directed program by the caregiver. Participants included family members or friends caring for a loved one who had a stroke. They cared for survivors of their first stroke and were able to speak and read English. Caregivers completed a baseline questionnaire, and follow-up assessments at 3, 6, and 12 months after the stroke date. This follow-up assessment strategy allowed us to determine when during intervention delivery caregivers show improvements on outcome measures. A sub-set of caregivers were invited to participate in qualitative interviews to further explore their experiences with various supports received. Current Status: We have completed the study with 310 family caregivers enrolled and are currently in the process of analyzing the data. "Long-Term Outcomes and Needs Assessment in ICU Survivors of Prolonged Mechanical Ventilation and their Caregivers"
We are conducting an observational study across 10 hospitals in Canada to obtain follow-up data on the long term outcomes of ICU survivors of prolonged mechanical ventilation and their family caregivers. Participants include ICU survivors who have been mechanically ventilated for 7 or more days, and their family caregivers. Caregivers are asked to complete five surveys over time, beginning at the time of study enrollment and continuing through to various time points up to 2 years post-ICU discharge. The surveys focus on impact of care on lifestyle and quality of life after their family member is discharged from ICU. A subset of caregivers is also invited to participate in a series of 3 qualitative interviews. Current Status: As of February 2012, we have recruited 562 patients and 400 caregivers into the study. Recruitment and follow-ups are ongoing. Stroke is a leading cause of adult disability and community re-integration is a priority for stroke rehabilitation. In North America, we have a growing population of individuals whose first language is not English. Little is known about the experiences of visible minorities living in North America as they re-integrate into the community post stroke or how these experiences change over time. Specifically, this research aimed to explore the experiences and needs of Chinese stroke survivors and family caregivers as they return to community living using the Timing it Right Framework as a conceptual guide. We recruited Cantonese-speaking stroke survivors and family caregivers from outpatient rehabilitation programmes. Using qualitative interviews conducted in Cantonese or English, we examined their experiences and needs as they return to community living and explored the influence of culture and time on their experiences. The interviews were transcribed and translated, and then analysed using framework analysis. Using framework analysis, we coded the data corresponding to the phases of the Timing it Right framework to determine the influence of time on the themes. We interviewed five Cantonese-speaking stroke survivors and 13 caregivers in 2009. We identified two main themes: (i) Participants' education and support needs change over time and (ii) Chinese resources are needed across care environments. These resources include access to care in their preferred language, traditional Chinese medicine, and Chinese food during their recovery and rehabilitation. To optimise Chinese stroke survivors' and caregivers' community re-integration, healthcare professionals should provide timely and accessible education and be aware of the role of Chinese diet and traditional medicine in stroke survivors' rehabilitation. See full study report here. To help facilitate the transition home, some hospitals offer a ‘weekend pass’ during inpatient rehabilitation, during which the patient is sent home with family during the weekend. This study explored stroke survivors', caregivers', and health care professionals' perceptions of weekend passes. A qualitative descriptive study was conducted of 16 stroke survivors, 15 caregivers, and 20 health care professionals' from a rehabilitation hospital. During recorded interviews, participants discussed their perceptions of the purpose of the weekend pass, experiences with the weekend pass including supports needed, and weekend pass administration. Focus group and interview data were audio recorded, professionally transcribed, checked for accuracy, and analyzed using conventional content analysis. We identified 3 key themes: i) preparing for patients to be safe at home; ii) gaining insight through the weekend pass; and iii) the emotional context of the weekend pass. These themes varied by participant group. We learned that when offering weekend passes, stroke care systems should carefully consider patients' and caregivers' readiness, emotional state, and preparation for weekend passes. The weekend pass experience can inform in-patient therapy, provide patients and caregivers with insight into life after stroke, and help prepare patients and families for the ultimate transition home.